The field of CMA (complex macromolecular architecture) stands at the cutting edge of materials science, and has been a locus of intense research activity in recent years. This book gives an extensive description of the synthesis, characterization, and self-assembly of recently-developed advanced architectural materials with a number of potential applications. 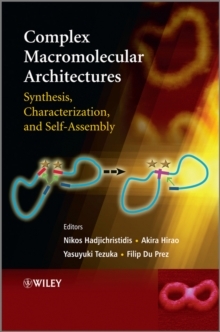 The architectural polymers, including bio-conjugated hybrid polymers with poly(amino acid)s and gluco-polymers, star-branched and dendrimer-like hyperbranched polymers, cyclic polymers, dendrigraft polymers, rod-coil and helix-coil block copolymers, are introduced chapter by chapter in the book. In particular, the book also emphasizes the topic of synthetic breakthroughs by living/controlled polymerization since 2000. Furthermore, renowned authors contribute on special topics such as helical polyisocyanates, metallopolymers, stereospecific polymers, hydrogen-bonded supramolecular polymers, conjugated polymers, and polyrotaxanes, which have attracted considerable interest as novel polymer materials with potential future applications. In addition, recent advances in reactive blending achieved with well-defined end-functionalized polymers are discussed from an industrial point of view. Topics on polymer-based nanotechnologies, including self-assembled architectures and suprastructures, nano-structured materials and devices, nanofabrication, surface nanostructures, and their AFM imaging analysis of hetero-phased polymers are also included. Provides comprehensive coverage of recently developed advanced architectural materials Covers hot new areas such as o click chemistry o chain walking o polyhomologation o ADMET Edited by highly regarded scientists in the field Contains contributions from 26 leading experts from Europe, North America, and Asia Researchers in academia and industry specializing in polymer chemistry will find this book to be an ideal survey of the most recent advances in the area. The book is also suitable as supplementary reading for students enrolled in Polymer Synthetic Chemistry, Polymer Synthesis, Polymer Design, Advanced Polymer Chemistry, Soft Matter Science, and Materials Science courses.